Woah, its been a long time since I played some Football Manager 2014. When I last left off, I had just managed to get Bristol City back in to the Championship at the first time of trying. So what next? Stop the press! Bristol City manager resigns. Yes that right, I resigned, I fancied a new challenge in a new league. Initially I wanted to go to Sassuolo in Italy, they’re a club with some good players, and are performing pretty well. They just seemed like an interesting option. I declared my interest in the job, and applied, but they instantly laughed off my interest, the big meanies! 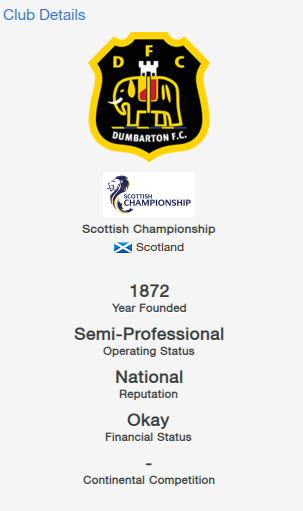 I also had a number of Scottish clubs showing interest in me, and eventually signed for Dumbarton FC who are currently in the Scottish Championship. People may think it was an odd choice, and that a club of this size was ‘below’ me. But I was happy to sign for them, and hope to get them in to the Scottish Premier League within two seasons, one if I’m lucky. They had a small squad, but the players that they did have were actually pretty good. I could see a lot of potential in the younger players, and told the board I would like to develop them. I was handed a £20k transfer budget, and just under £7k for wages. I wasn’t planning on overhauling the team to much, just strengthen a few positions. I also told the board that I was hoping to finish in the top half of the table, in reality I would like to push for promotion, but I didn’t want to promise something I might not be able to deliver – manage expectations and all that. I could tell that my youngsters had bright futures by the number of clubs that were bidding for them. 18 year old AMC Ally McKerracher was one player receiving a lot of interest, valued at £13.5k, I was already getting bids close to £100k for him. It was tempting to cash in, but as building from the youth team was my focus, I wanted to keep him. Luckily the interest hasn’t unsettled him. He was starting to show his promise in the second friendly where he garbed a brace, and since the season start he has been a regular grabbing 3 goals in his first 4 games. Pre season was a time to get to know my squad a little better, and I quickly decided on my first 11, but it wasn’t hard when you only have 17 players to choose from. We performed quite well in our friendlies winning 2 and losing 2. I’ve opted for a high tempo pressing and passing game, and so far the players are performing well under the new tactics. At the end of Pre season, 5 new players have come in, mostly on free or loan, and 8 players have left due to contracts running out. Although I may look to resign a couple of them, as they left before I got to the club, and some of them looked decent. So my season expectations, I’m hoping for promotion, but a title challenge would be good. Players to watch – Ally McKerracher (AMC), Mitch Megginson (ST), Ruben Garcia Rey (CB, last years fans players of the year). I’m hoping for some big performances from these guys, with Ally developing his already solid game.